Sixteen thousand signatures were collected and given to San Francisco’s Department of Elections to get Universal Child Care on the June 2018 ballot. Yes. We. Did. We completed the seemingly impossible task of placing the Universal Child Care initiative on June's ballot in less than 20 days! This could not have been possible without the support of a super army of volunteers and organizations that got the job done. 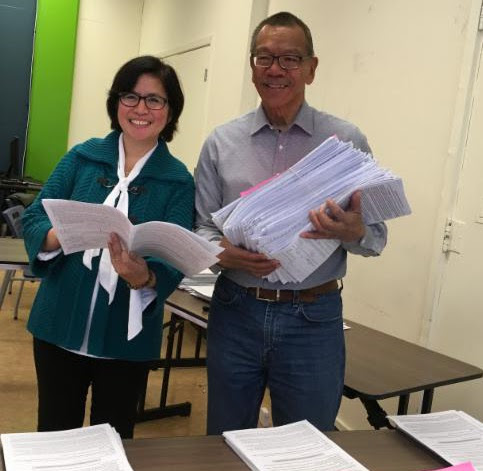 About two weeks ago, we were approached with a challenge: Collect 16,000 signatures from registered San Francisco voters to support placing the Universal Child Care initiative on the June ballot. Normally, a decent signature campaign takes a good month to organize; an excellent campaign can take up to two months. But, time was not on our side. We were skeptical if our efforts would be futile, but I remained optimistic--I believed we could do it. The stakes were just too high not to make an attempt. San Francisco is losing families with children at a rapid pace. There are just not enough affordable quality early care and education programs for our working families with babies 0-5. We had to give it a shot. But, all the elements had to align perfectly. Would we raise enough funds to kick off a strong campaign? Would the weather during our two-week stint be in our favor? Would we get the official petitions in time to collect signatures at the Women's March? And most importantly, could we mobilize a devoted volunteer base to work effectively and efficiently to hit our goal? Little did we know that the answers to all of our fateful questions would be astoundingly yes, yes, yes and YES! We have so many incredible people to thank for this feat. Organizations like the San Francisco Child Care Providers Association, Parent Voices, Family Child Care Association of San Francisco, and numerous other early education and community organizations jumped into the campaign in a FLASH! I especially want to thank Sara Hicks-Kilday, Erica Maybaum, Maria Luz Torres, Mary Ignatius, Ivy Lee and Tim Hudson. They, in particular, worked tirelessly over the last two weeks. We are powerful beyond belief because of our deep commitment to the children and families of San Francisco. Please join us on the big next step: PASS the Universal Child Care Initiative in San Francisco! Let's make quality early education programs affordable for all families and increase the wages of our underpaid educators. Newer Post人日快乐 Happy Human Day!